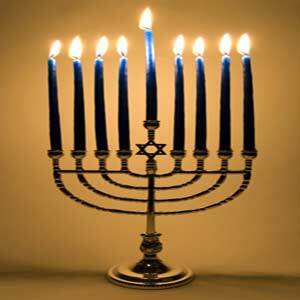 Hanukkah, the Festival of Lights, is the Jewish celebration of the Macabees and the miraculous small amount oil that lasted for eight days. Hanukkah started today (the 20th) and will end on the 28th. There are many different traditions associated with the holiday, traditions that are quite interesting. The menorah is placed in the window and features nine candles, eight of which are lit over the course of the festival. The middle candle is used to light the others. Every night, another candle is lit until, on the 28th, all nine burn. These flames represent the relighting of the eternal flame at the Holy Temple, a flame which should have only burned for a day but the oil lasted over a week. While Hanukkah is quite different from Christmas, there are some similarities between the two. Decorations, mostly done in white and blue, are hung around the house. Children also get gifts during Hanukkah—a small gift or some money are given on each night of the festival. There are traditional games, stories, and songs that go with Hanukkah, of course. Many families tell the story of the Macabees and the miracle of the oil. The dreidyl game and its accompanying song are played during Hanukkah. Most people recognize this four-sided top, even if they don’t know how to play the game. There’s also some great food associated with Hanukkah. The two traditional items are latkes and sufganiyot. Latkes are fried potato pancakes, while sufganiyot are jelly donuts. The two are traditional Hanukkah food because they’re made with oil, another connection to the Macabees story. Hanukkah Flowers, Kansas City, MO.